Xiaojun (pronounced “shee·ow ji·win”) received his Ph.D. in Political Science from Stanford University and joined the department in 2013 as an assistant professor. He has also held visiting positions at Harvard University’s Fairbank Center for Chinese Studies (2014-2015), Fudan Development Institute (2016), and University of Hawaii’s East-West Center (2018). His previous and ongoing research on international and comparative political economy can be broadly divided into three research programs that investigate (1) the impact of domestic politics on the process and content of foreign economic and security policies, (2) the impact of global supply chains on trade and investment, and (3) the political economy of trade liberalization in developing and post-communist countries. In all of these research programs, he uses China as the primary case of inquiry and employs a variety of methods, including interviews, archival research, historical institutional analysis, survey research, web-scraping, and large-N analysis. His work has appeared or is forthcoming in Journal of Politics, International Studies Quarterly, Canadian Journal of Political Science, Chinese Journal of International Politics, Foreign Policy Analysis, International Relations of the Asia-Pacific, Journal of Contemporary China, among others, and has received grants and awards from such organizations as the Social Science and Humanities Research Council of Canada, the National Science Foundation of the United States, the American Political Science Association, the International Studies Association, the Association of Chinese Political Studies, and the Chiang Ching-Kuo Foundation. 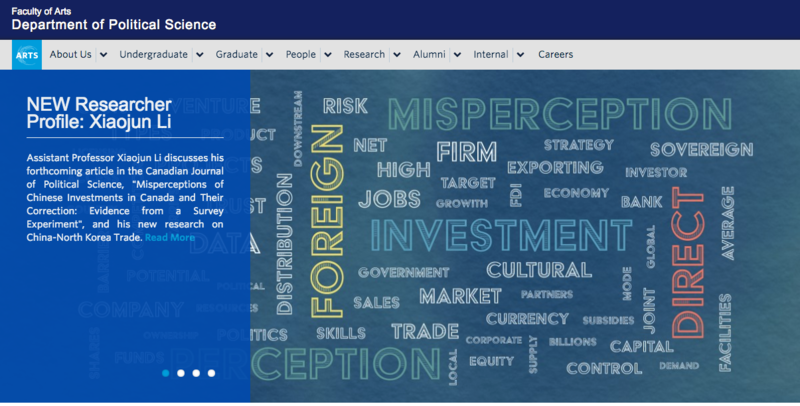 At UBC, he offers undergraduate and graduate courses in international political economy, Chinese politics and Development, China in the world, and Quantitative Methods. For more information on his published and ongoing research, please visit his personal website. The course will explore various aspects of Chinese politics and the dynamics of Chinas development since 1949. Topics include: the Cultural Revolution, political reform and protest, and economic reform policies and their consequences. Impact and implications of the rise of China in historical and contemporary perspective. Stephano Burzo, PhD co-supervisor, 2018-present. Yoel Kornreich, PhD Dissertation Committee Member, 2015-2018. Linting Zhang, PhD Dissertation Committee Member, 2015-2018. Charles Bain, MA 2017, Thesis Examiner. Miaofeng Zhang, MA 2016, Thesis Examiner. Wan-Ting Lu, MA 2016, Thesis Examiner. “Historical Ownership, Territorial Indivisibility, and International Conflict” (with Songying Fang), forthcoming, Journal of Politics. “Anticipating Exclusion: Global Supply Chains and Chinese Business Responses to the Trans-Pacific Partnership” (with Robert Gulotty), conditional acceptance, Business and Politics. “Misperceptions of Chinese Investments in Canada and Their Correction: Evidence from a Survey Experiment” (with Yingqiu Kuang* and Linting Zhang*), forthcoming, Canadian Journal of Political Science. “Business as Usual? Economic Responses to Political Tensions between China and Japan” (with Adam Y. Liu*), International Relations of the Asia-Pacific, forthcoming. “To Join or Not to Join? State Ownership, Commercial Interests, and China’s Belt and Road Initiative” (with Ka Zeng), Pacific Affairs (2019), Volume 92, Issue 1, pp. 5-26 (lead article). “China’s Evolving Motivations and Goals in UN Peacekeeping Participation” (with Songying Fang and Fanglu Sun), International Journal (2018), Volume 73, Issue 3, pp. 464-473. “Unpacking the Patterns of Corporate Restructuring during China’s SOE Reform” (with Jean C. Oi), Economic and Political Studies (2018), Volume 6, Issue 2, pp. 118-134. “The Face of Internet Recruitment: Evaluating Labor Markets of Online Crowdsourcing Platforms in China” (with Weiyi Shi and Boliang Zhu), Research and Politics (2018), Volume 5, Issue 1, pp. 1-8. “Public Perceptions of International Leadership in China and the United States” (with Stefano Burzo*), Chinese Political Science Review (2018), Volume 3, Issue 1, pp. 81-99. “Individual Preferences for FDI in Developing Countries: Experimental Evidence from China” (with Ka Zeng), Journal of Experimental Political Science (2017), Volume 4, Issue 3, pp. 195-205. “Does Conditionality Still Work? China’s Development Assistance and Democracy in Africa”, Chinese Political Science Review (2017), Volume 2, Issue 2, pp 201-220. “Chinese Citizens’ Trust in Japan and South Korea: Findings from a Four-City Survey” (with Dingding Chen and Jianwei Wang), International Studies Quarterly (2016), Volume 60, Issue 4, pp. 778-789. “Measuring Local Corruption in China: A Cautionary Tale”, Journal of Chinese Political Science (2016), Volume 21, Issue 1, pp. 21-38. “Who Pollutes? Ownership Type and Environmental Performance of Chinese Firms” (with Chris Chan*), Journal of Contemporary China (2016), Volume 25, Issue 98, pp. 248-263. “Understanding China’s Behavioral Change in the WTO Dispute Settlement System: Power, Capacity and Normative Constraints in Trade Adjudication”, Asian Survey (2012), Volume 52, Issue 6: 1111-1137. “U.S. Military Aid and Recipient Country Cooperation” (with Patricia Sullivan and Brock Tessman), Foreign Policy Analysis (2011), Volume 7, Issue 3: 275-294. – Reprinted in Helen V. Milner and Dustin Tingley (eds.) Geopolitics of Foreign Aid. Vol. II. Cheltenham: Edward Elgar, 2013. “Social Rewards and Socialization Effects: an Alternative Explanation to the Motivation behind China’s Participation in International Institutions”. Chinese Journal of International Politics (2010), Volume 3, Issue 3: 347-377. – Reprinted in Xuefeng Sun, Matt Ferchen and M. Taylor Fravel (eds.) China’s Rise and International Norms. Oxford University Press, 2012. “Regulating China’s Inward FDI: Changes, Challenges, and the Future”, forthcoming chapter in Jacques deLisle and Avery Goldstein (eds.) China’s Reform and Opening: 40 Years and Counting. “Environmental Management, Financing and Performance in Chinese Firms: Evidence from a Nationwide Survey”, in Bingqiang Ren and Huisheng Shou (eds.) Governing the Chinese Environment in a Changing Society: Dynamics, Challenges, and Prospects (2013), Palgrave Macmillan. “Learning and Socialization in International Institutions: China’s Experience with the WTO Dispute Settlement System”, in Mingjiang Li (ed.) China Joins Global Governance: Cooperation and Contentions (2012). Rowman & Littlefield: Lexington Books. “Reciprocity and Adaptation in U.S-China Foreign Policy Behaviors”, in Robert Grafstein and Fan Wan (eds.) A Bridge Too Far? : Commonalities and Differences between China and the U.S. (2009), Rowman & Littlefield: Lexington Books. “China is offering ‘no strings attached aid’ to Africa. Here’s what that means.” The Washington Post/Monkey Cage, September 27, 2018. “Les Québécois Positifs et Pragmatiques Face à la Chine” (with Paul Evans and Pascale Massot), Les Affaires, May 20, 2018. “Quebec Survey Respondents Positive, Pragmatic about Ties with China” (with Paul Evans and Pascale Massot), The Hill Times, May 18, 2018. “Xi’s China a source of worry and wonder for Canadians” (with Paul Evans), The Globe and Mail, October 26, 2017. “Pragmatism admist Anxiety: Canadian Opinions on China and Canada-China Relations” (with Paul Evans), Institute of Asian Research, October 17, 2017. “China as a Trading Superpower”, in Nicholas Kitchen (ed.) China’s Geoeconomic Strategy, LSE IDEAS Special Report 12, London School of Economics, London, UK., 2012. “Legalizing Nuclear Abandonment: When Do States Enter Nuclear Weapons Free Zones?” (with Matthew Fuhrmann) , Harvard Kennedy School Managing the Atom Project, March 14, 2008. “China and Multilateral Export Control Regimes: A Case of Socialization Effects in International Institutions”, The Monitor (2006), Volume 12, Issue 1: 10-14, Center for International Trade and Security. “Trade Conflict and Consumer Choice: Evidence from Canada” (with Adam Liu), under review for special issue on Trade and Conflict in Canadian Foreign Policy Journal. “Public Opinion, International Reputation, and Audience Cost in an Authoritarian Regime” (with Dingding Chen), revise and resubmit. “Territorial Indivisibility and Domestic Preference for Dispute Resolution: Evidence from Japan” (with Songying Fang, Daina Chiba, and Atsushi Tago), under review. “Geopolitics, Nationalism, and Foreign Direct Investment: Perceptions of the China Threat and American Public Attitudes toward Chinese FDI” (with Ka Zeng), under review. “The Politics of Firm-level Environmental Regulatory Actions in China: Does Fixed Asset Intensity Affect Pollution Levies, Punitive Actions and Firm Environmental Ratings?” (with Qing Deng, Zijie Shao, and Xun Cao), in progress. My latest CV can be found here.